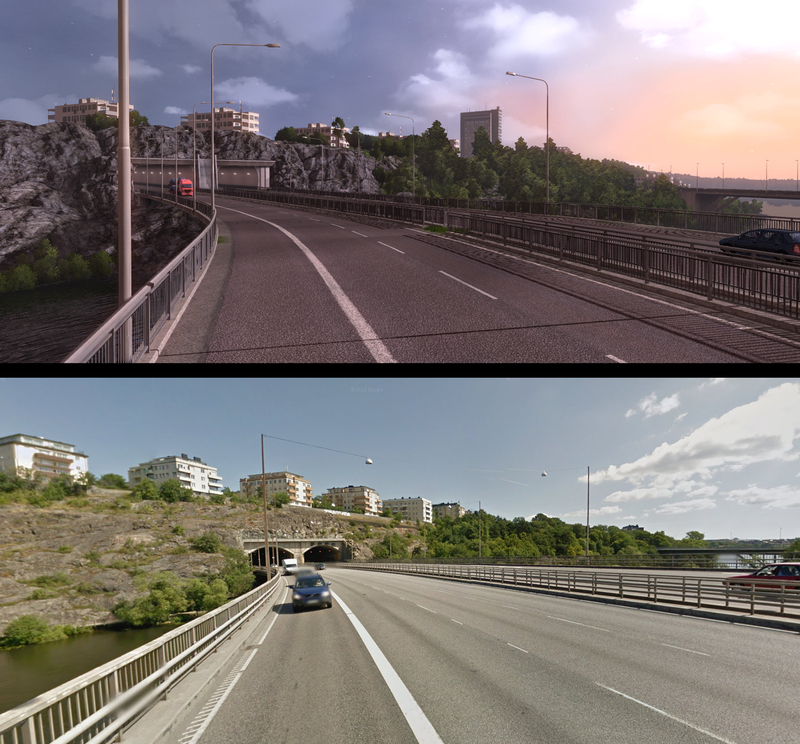 Map production of ETS2 Scandinavia add-on is in the final stages. That's not to say it is completed, there is a lot of testing, tuning, and optimizing ahead of us. You should be aware that with the scale of the add-on, it will take months of polishing before we can consider our work ready for release. Our map design team is taking great pains to get the feeling of the region right and to make the Scandinavian cities and environments as they are in real life. Even though our programmers keep improving our tool chain for better efficiency, such detailed environments are harder and take longer to build than what we were used to only 2-3 years ago. Of course not every part of the map can be made true-to-life based on a real location, but we sprinkle the world with such locations generously. Our hope is that such attention to detail will boost the fun with exploration of the world, especially for our players in Scandinavia who know these places very well. 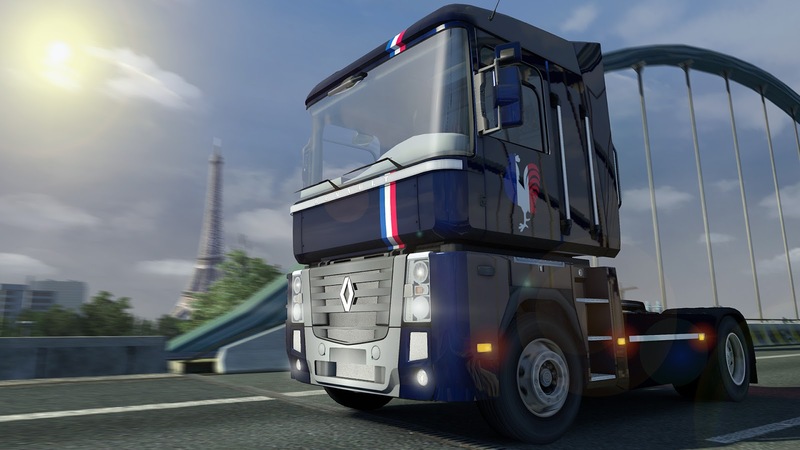 Meanwhile, the quest to offer dedicated paint liveries for truckers in the countries where our game sells the best continues today, with the release of French Paint Job Pack DLC for Euro Truck Simulator 2 on Steam. Check it out! nice work SCS! another great looking update! any guesses on how much it will be(the Scandinavia DLC)? Thats astonishing. It's so beautiful and realistic, fantastic job so far SCS. I will definitely buy the Scandinavia DLC, and I'm not even going to question it. One question; what will be the northest city? Looks awesome. Can't wait. Any chances of see more mountains? I would guess so, Finland is a part of Scandinavia. So I wouldn't have called it a Scandinavia DLC if one of the countries is missing. No they are not. "Slovenian_Gamer" has it right. But it's a common mistake. Sweden - Denmark - Norway are the Scandinavian trio. The rest (Iceland & Finland) are part of the Nordic countries, along with the other three. Finland are at most Fenno Scandinavian. Here is a link for you or anyone else interested that explains it in a very simple way. SCS: Love the pics of Stockholm, with Essingeleden and the Fredhälls tunnel above. Scandinavian peninsula, Jutland Peninsula and adjacent islands. Scandinavia has traditionally includes three countries - Sweden, Norway and Denmark. The same is the interpretation of the concept of Scandinavia in Sweden , Norway and Denmark. In a geographical sense, the concept of Scandinavia is sometimes synonymous with the Scandinavian peninsula. In some editions of Scandinavia in a broad sense also includes Finland, Iceland and the islands of the North Atlantic , moving closer to the concept of "Nordic countries" (Swede. Norden, Eng. Nordic countries). In the scientific literature region comprising Scandinavia and Finland, called Fennoscandia. Please make a DLC about SLOVENIA. Map or paint jobs, I just want my country to be a part of this game. This Scandinavia DLC looks great. Thought Strasburg still far from reality , i recognize some parts there. It looks awesome. I'm really looking forward to this. After this is released and if you'd like to expand Europe even more I'd recommend going south. Been in Greece this summer. One of the most beautiful, if not the most, scenery in Europe. Please make the Paint Jobs for all country from the European Continent because always smeone will be victim. ha dlc scandinavia vai ser comprada com dinheiro ou vai ser gratuita? O yes! Instead of making ATS, continue Europe, pleace. Southern E.U., Portugal-Spain, southern France and Italy including up to Rome. There are a couple of teams in SCS. One of them works on ATS, and it's good that way. There is a whole different team working on ATS, so this DLC and the release of ATS aren't related in any way. Keep up the good work and thank to your team again for their hard work and dedication. SCS maybe you will tell us more about the Scandinavian DLC, you know the names of the cities now so mabye you will write about it? We all are very curious. Yes, a good question, can you ask it on their Facebook page, you might get an answer over there. Hopefully, it will be in the next patch 1.14, but, I won't hold my breath. Love it SCS! Can't wait to get it when it comes out! So....months and months before this DLC release...does this mean the same for ATS but years instead? :( i wanna play ATS before i die please..
Keep cool man, ATS will come in 2015. Maybe february, maybe a few months later, maybe even in early access on Steam sooner, why not. Great work! I see u guys are using a lot of normal maps on those rocks´s, i love that effect. Maybe u can use this to upgrade the old locations of game, and an HD DLC with new textures will improove the game to, just an ideia. Cheers fron São Paulo - Brasil. Not European continent, but European Union! Namely Southern EU. The continent is commonly called Eurasia... Europe is only the western region of it. Arabia and Asia are part of the same contient, albeit on different tectonic plates. For those of you who are making some confusions about Europe, go check this: http://en.wikipedia.org/wiki/Continental_Europe. For you to consider Euroasian continent, you need to put it as a Super continent, not only a continent, Europe still is considered as continent! Rene Brehmer, you are right in part. If you'll check out the borders of the 2 continents (Europe and Asia) you'll see that those borders are very defined, that's why Euroasia is considered by many as a supercontinent because the 2 continents share the same land mass but are devided by those borders to make a clear distinction of both. i think it would be nice if the would release a Pre Beta or.. like that you can PRE-ORDER it and they give you a beta under your own risk.. so that we dont have to wait months and we could help them test it :D they dont take this the smart way.. this is what i would have done..
pre-beta sale of the addon, pre-beta release and then after the finnalizing stages give them the the stable one and sell it to the others who diddent preorder. No no no))) Stoping working on ATS and continue southern EU - true way! The trucks in the game have ABS brakes (in the real world). Locking up the wheels is actually not possible. The air brake and fuel consumption simulation is however exagerated, but that's why I turn it off. But I will agree that the RPM/transmission simulation is wrong. The auto 12 is supposed to go 1100 in 12th @ 80 kph, but instead it goes 1300 in 11th, and it won't shift up till it hits 2000 rpm when it's supposed to shift at 1600. Even if it was set to "performance" it should still drop into 12th gear when cruising at 80 kph. Next DLC from SCS will be ITALY! Seems most likely, with Spain, west-France and Portugal ofcourse. I want to Suggest some updates for EURO TRUCK SIMULATOR 2. How can i do this...? is this will be free ? Of course not. SCS isn't a non-profit organization and these guys need to eat and pay there bills too. Nice work scs but don't be let . 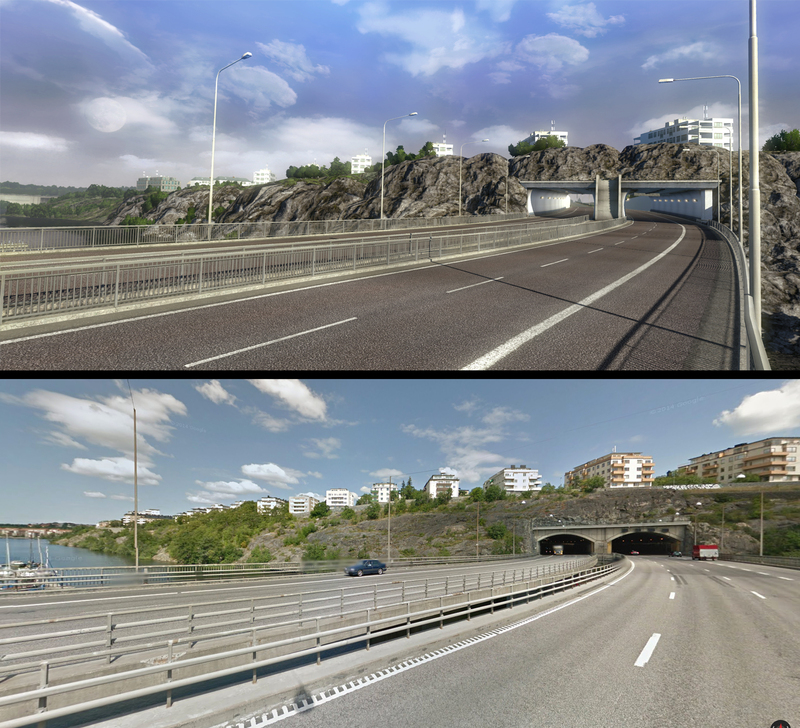 I cant wait for the scandinavian map to cone to ETS 2. The scandinavian environments looke just extsacly like in real life. Great work SCS . The Big Question is are you going to release it before the Daf or together. In the next dlc are you including ireland or is that for another dlc. Also when will you be releasing buses\coaches for sale. thank you to those who made this ;) !!! One question though. Will you go back and redo old cities, especially big ones, to give it the same real life look as Scandinavia? I think about cities like Rotterdam, Amsterdam, Berlin, Paris, Munchen, Vienna, Prague, Budapest, etc. And than maybe later going to address smaller cities that are starting points for players, like my hometown... Groningen in the Netherlands. When will this update be finished ?? i think it will not be finished this year or is it wrong ?? I just wonder, In the early days of this Scandinavian DLC every-one was aiming for small, hard to drive mountain-road with narrow corners. Now nobody talks about this kind of adventure anymore. I really hope this kind of roads will be part of this DLC. That would really be cool to drive. How much of Denmark will be in there? Given the scale of the map, there isn't room for much. but for a trucking game about freight Padborg is mandatory (biggest transit junction in the country and possibly Scandinavia), and you can't have Sweden without Copenhagen and the Oresund bridge (which sits in central Copenhagen) to Sweden. Rødby-Puttgarden ferries should be in there as well, since it's also a main trucking route. There's a few cities along the way that ought to be there, but again, with the scaling it may not be possible to include them. And you're still missing Flensburg as well (in Germany), which honestly makes little sense to not include when adding Scandinavia. Awesome job, I will get this when it's released. Yes, the more detail, the more fun exploring the map. Fantastic. Saving some pennies. Thanks SCS. Keep up the development. I think SCS need to do the snow location in the game,not? Thanks for your effort, you are real craftsman!! what motorway is it in Stockholm ? The screenshots are awesome. At first, I thought that the pair of pictures showed two revisions of the map model. I confused them with photographs of the real sites. 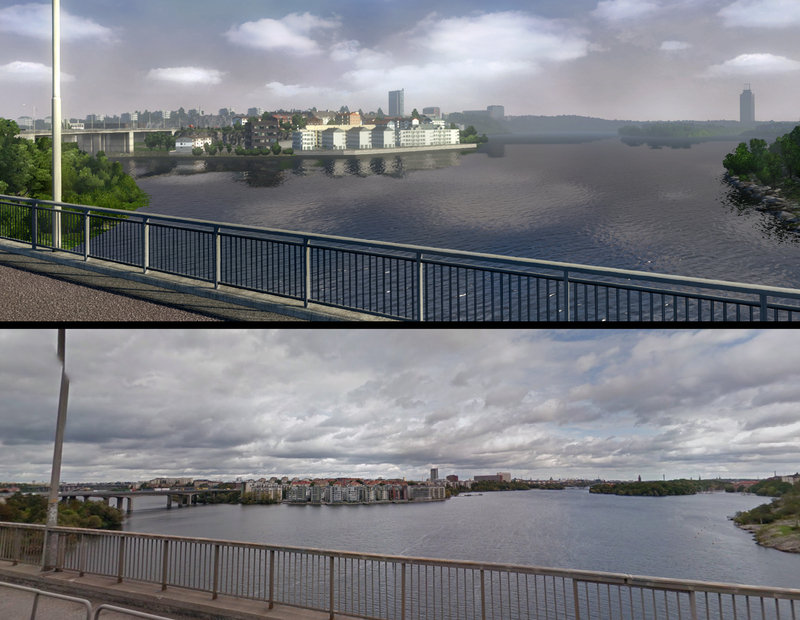 Why did SCS remove one lane on the Swedish bridge? Based on the Google Maps images, the bridge is 8-lane. In-game the bridge is only 6-lane. A Suecia e a terra natal da Scania, era o que estava faltando, interessante seria se tivesse caminhoes pequenos e motocicletas no trafego e tambem seria muito bom se colocassem retornos a cada 1 KM como e na realidade, fica aqui minha sugestao e nao uma critica, parabens aos desenvolvedores. Hi. i cant see whats new about the last updates(1.13.4.1s), Can some one tell me, please. Hi. we need more employeed. it should be 5 per city. there should be some excellent cars and small trucks in the games those are controllable and manageable, as we might bore always from playing lazy/heavy trucks. There are already plenty of car mods on different webs, but those are not controllable, worst engine voice and can't provide the good view of the road/outside. Then i would suggest to play GTA V, because this is Euro Truck Simulator , with the word TRUCK in it. so i wouldn't hope for that. How is it better than nothing? It's a made up date. I can say it's going to be released next week, doesn't mean it's based on anything from SCS. Going to be difficult since most map mods have been updated since 1.7.1 and won't work. Update to latest version and google search is your friend. WTF ... If believe in that what is on the Amazon, so we will have Scandinavian DLC on 4/02 and the ATS with California starter on 15/02 and the each American state separately in the DLC's. Just great. Marry Christmas and happy money. Amazon is guessing. SCS hasn't released a date yet because they don't know. Does it include Finland too? Future, I would like to operate in a game like this trailer. My hope is to come true. I don't know it's that possible. These are very long vehicles. In the game are places where it's very hard to turn in right or left direction. In normal life, when that kind of loads are crossing the country, sometimes you mast remove signs, electric traction etc. This is an idea for a new game, where it will be possible. Gr8 Work so far! I can't wait for this map part to come out & be released! Isn't there is a mod called "Pro Mods" which also add Scandinavia to the game? Why do we have to wait for SCS Scandinavia if we already have Pro Mods? Could someone tell me the differences between SCS Scandinavia and Pro Mods? Well, as with all unofficial mods, they dont work a 100%, can make the game crash and corrupt your save files and so on, so my guess is that sinse they know promods is very popular they want to make Scandinavia an official part of ETS2, i for one can´t wait for the official part. But thats just my 2 cents worth of thoughts, if thats the actual reason or not i can only speculate, but IMO that is what make sense. Wow! It's looking amazing, cant wait for it! Will there be paint with Sweden in mind? not that it matters that much to me, but i would love to be able to drive with something quintessential Swedish on my truck. PS, can not wait for the Scandinavian DLC, great work SCS looks amazing.